"...It is the only play I’ve ever seen that could simultaneously appeal to fans of the World Wide Wrestling Federation and intellectual progressives (not that those groups are mutually exclusive). Heck, this killer show whipped the opening-night audience into a frenzy not seen at the Biograph since John Dillinger left the building. It will appeal to anyone who thinks that theatrical food for thought is always best dispensed with a good, swift kick to the head." 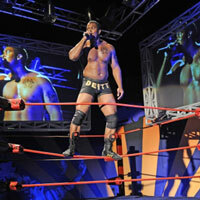 "...I was hooked from the word go on "The Elaborate Entrance of Chad Deity," Kristoffer Diaz's big, brash, outrageous, brilliantly written, astonishingly realized, altogether electric (and sure-to-be-controversial) play about wrestling, terrorism, globalization (and more) that received a knockout world premiere Monday on the Victory Gardens mainstage." "...He pairs up with a smooth-talking Indian kid from Brooklyn who wrestles as the Fundamentalist—complete with turban and burka-clad handmaidens—to take on perennial champ Chad Deity, a charismatic black man with no real skills. Although Eddie Torres's staging lags slightly toward the middle, this world premiere deserves to be talked about for years to come." "...Kamal Angelo Bolden postures with eager-to-please coquetry as the iconic Chad Deity, along with Christian Litke as his various challengers ( together comprising a burlesque-show display of beefcake ) , while Usman Ally projects feline charisma as the sardonic Vigneshwar Paduar. And James Krag embodies the greedhead bosses who sign the checks. But it's Desmin Borges who breaks our hearts as the humble Latino storyteller whose dreams are thwarted by a social system content to traffic in easy stereotypes for a gullible public." "...Chad Deity is a terrifically sensory experience but there is a thoughtful storyline embedded in the visceral visual and sound spectacle. Even conceding that open night audiences are notoriously favorable to a play, the reaction of the first night crowd at Victory Gardens reached an emotional pitch rarely seen in a theater. We eagerly await what Kristoffer Diaz has for us next." "...Who’d have thought wrestling would make an arresting topic for a two-act play? My tolerance for WWE is around 10 minutes, before all the noise, yelling and dramatic pratfalls overwhelm the senses. But Kristoffer Diaz’s hilariously satirical new play, The Elaborate Entrance of Chad Deity, finds a compelling metaphor in wrestling, featuring an inner world of capitalism, pseudo-celebrity, and racism in American pop culture. Equal parts action, humor, entertainment and passion, this show is a winner." "...In his first full-fledged production, Brooklyn-based Diaz combines mad inventiveness with a nervy taste for button-pushing. He’s also created a deeply affecting central character; Mace, who narrates the play, is wrestling’s answer to Ralph Ellison’s Invisible Man. Rattling off his encyclopedic pop-culture knowledge, stepping out of the frame to offer footnotes on the action or lyrically and rhythmically ruminating on his past and present, Mace comes to dazzling life in Borges’s pitch-perfect performance." "...Fans of hip-hop, wrestling and physical satire may enjoy this show more than I did. The set (Brian Sidney Bembridge) features a large wrestling ring and the smashing lighting (by Jesse Klug) together with the vivid costumes (by Christine Pascual) make the production values strong, even outrageous. If you dig hip-hop language and love wrestling on TV, then this show is for you." "...Is wrestling an art form, a sporting event or theater? These are some of the questions posed in Kristoffer Diaz's marvelous new play "The Elaborate Entrance of Chad Deity" now on the main stage at Victory Gardens Theater. This was one of the finalists in Victory Gardens "Emerging Playwrights of Color" in 2008. Like the Studio production upstairs of "Year Zero," we were treated to a small part of this play last year and now, under the direction of Edward Torres in conjunction with Teatro Vista, we get to see a comic look at the absurd world of professional wrestling. What an evening of theater! Yes, this is unlike what most audiences anticipate, but let's face it, wrestling is theater of the absurd." "...By having greased up, impossibly muscle-y men tear through the audience waving flags and shouting threats, Chad Deity manages to instigate the kind of audience participation you’d find at ringside at a Vegas championship bout. It’s wildly fun, wickedly funny and deeply provocative. In the so-called fake world of professional wrestling, Diaz captures profundity, adventure, aspirations and true triumph. The result is a theatrical prize."